It’s almost all pink! 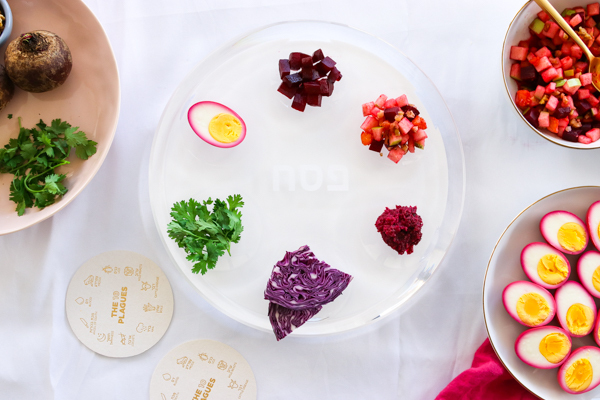 The prettiest pink seder plate in all the land, and it’s vegetarian too. And it’s feminist too! As my mom always says, you go girl. Allow me to explain. 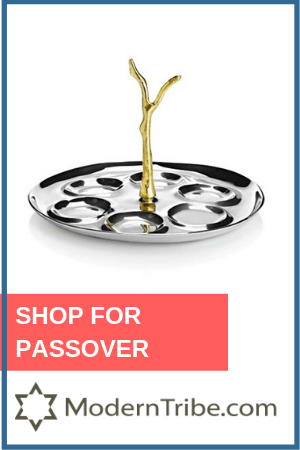 I love Passover traditions. Give me Matzah ball soup, a few rounds of Dayenu, and of course, the four glasses of wine and I’m as happy as a clam gefilte fish. But I love to add my own traditions too. 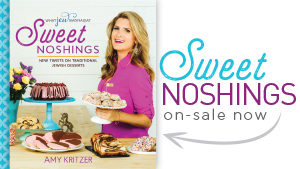 Whether that is a personalized Haggadah, a twist on matzah ball soup or even switching up the seder plate elements. 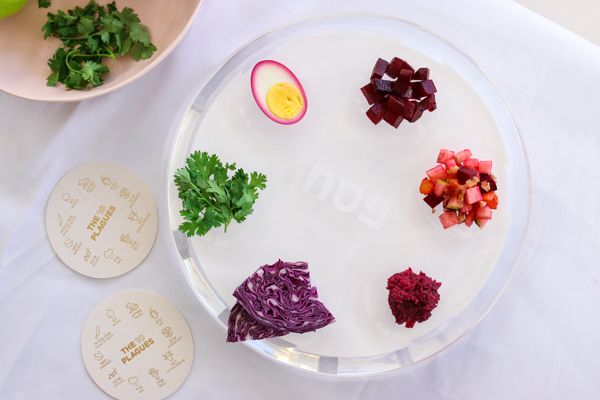 This milennial pink seder plate still has all the traditional components, but with a look as modern as the plate itself. 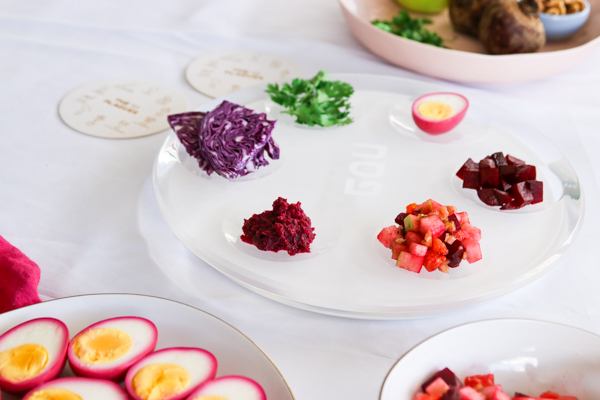 When I saw Apeloig Collection’s gorgeous Acrylic Seder Plate, I knew the clean white design would pop with some color. 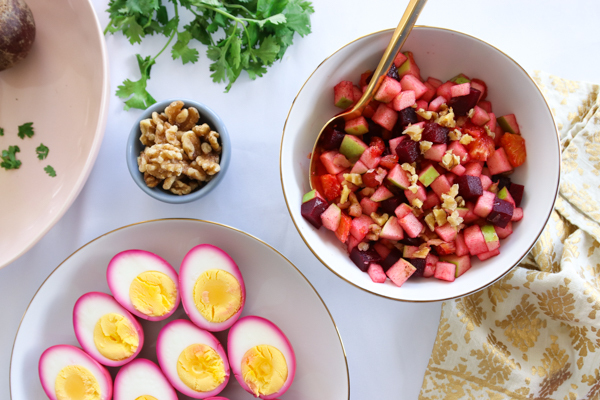 Most Jewish food is brown (brisket, chopped liver, rugleach, etc) so added color is a fun challenge for me! I love Apeloig Collection’s story. The Judaica collection (they sell challah boards, mezuzahs, even new afikomen bags and matzah covers too!) was started by two sisters, Daniela and Gabriela. They moved from their native Venezuela to Florida and created Apeloig Collection to match the elegant, minimalistic style they love. 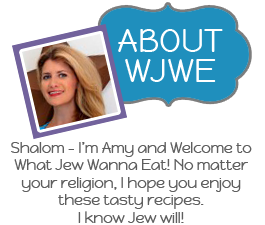 Their goal (similar to mine) is that more people will keep the Jewish traditions in a stylish and creative way. The sisters chose their family name for the collection to honor their grandfather, a Holocaust survivor. The passed the name down to their business much like they hope to pass down other Jewish traditions. 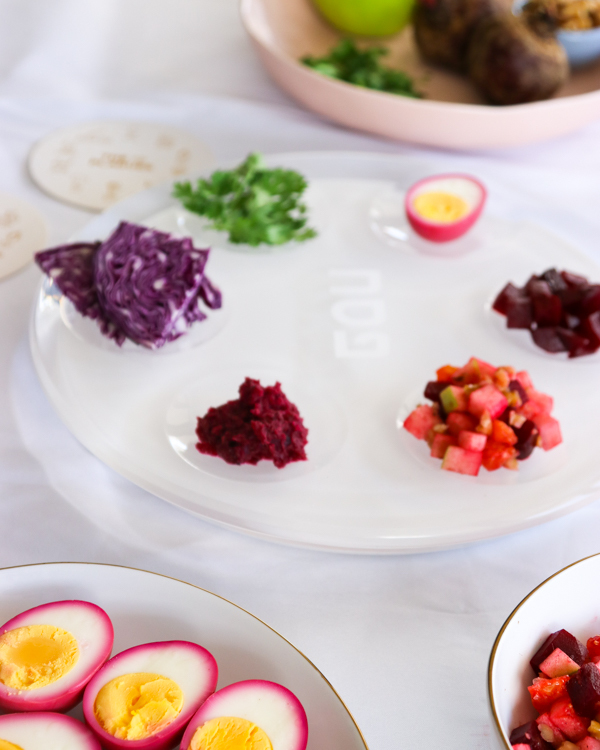 Anyhoo, I thought a bright seder plate would pop against the white acrylic plate. 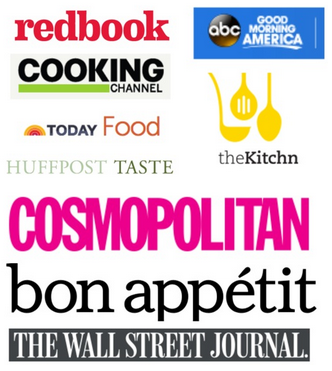 Featuring Orange Beet Charoset. Having an orange is actually a newish traditional part of the plate. Someone once said, a woman belonged on the bima as much as an orange belongs on the seder plate. So now we have an orange on the seder plate. Boom. 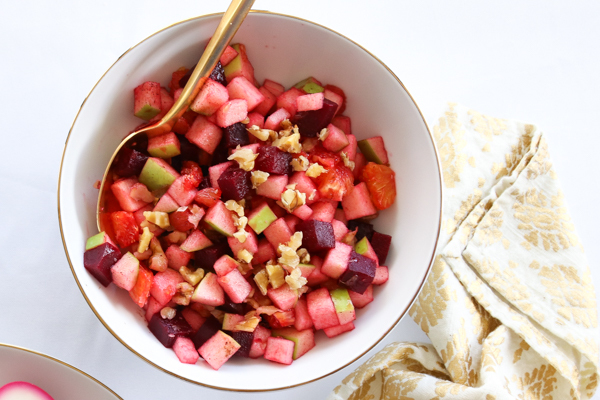 I incorporated the orange into my charoset and it compliments the beet and apple beautifully. Maror: symbolizes bitterness of the slaves. I used red horseradish. Z’roa: usually a lamb shank to symbolize sacrifice. I used beets, a common vegetarian replacement for the lamb shank. Karpas: symbolizes a new beginning, I used traditional parsley for a touch of green/contrast. 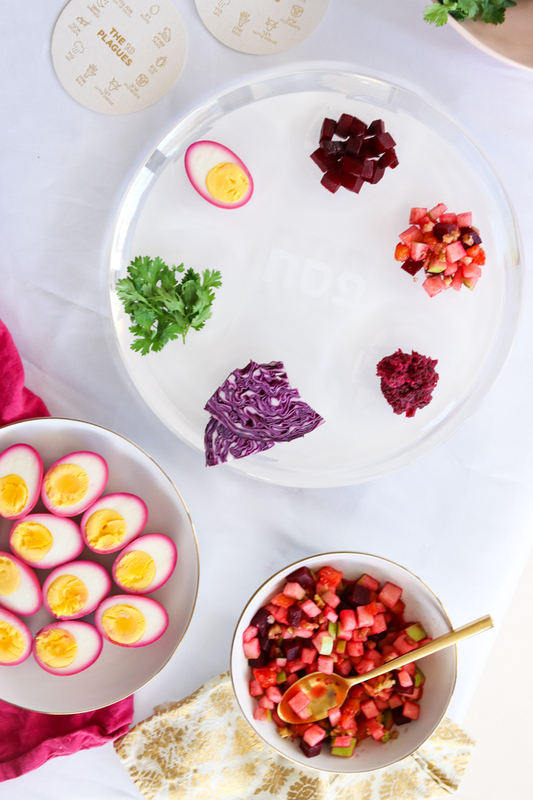 Purple potatoes or red onion would work too if you want it all pink! 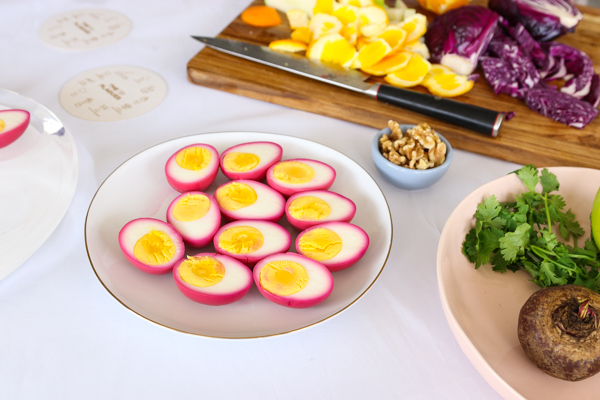 Beitzah: a hard boiled egg symbolizes the cycle of life. 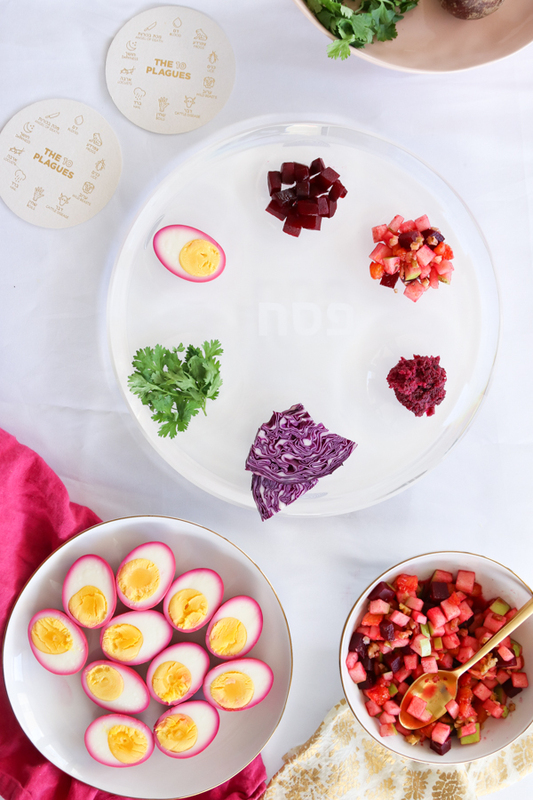 I used my pickled beet egg! You can see the subtle Hebrew “Pesach” on the plate from this angle. So pretty. Paired with the plate are my favorite 10 Plagues Coasters. Perfect for pinky dipping! 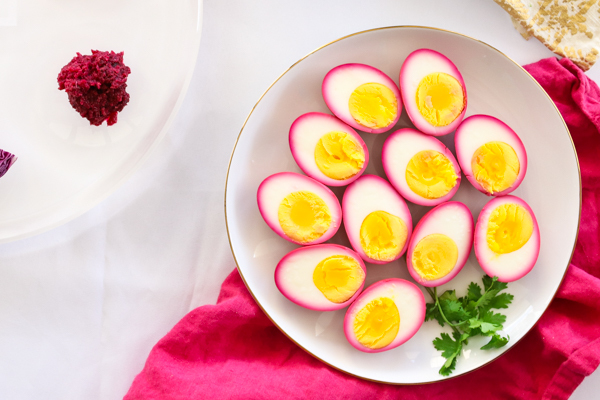 I suggest making a ton of these eggs and turning them into my Beet Deviled Eggs for a Passover appetizer! 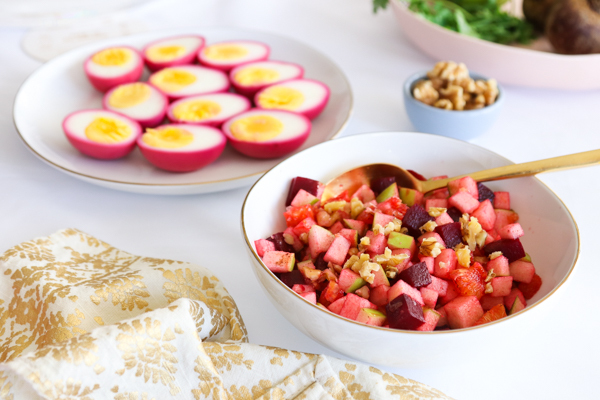 Incorporate the orange on the seder plate with this sweet and tart Orange Beet Charoset! Get those beets cooking! 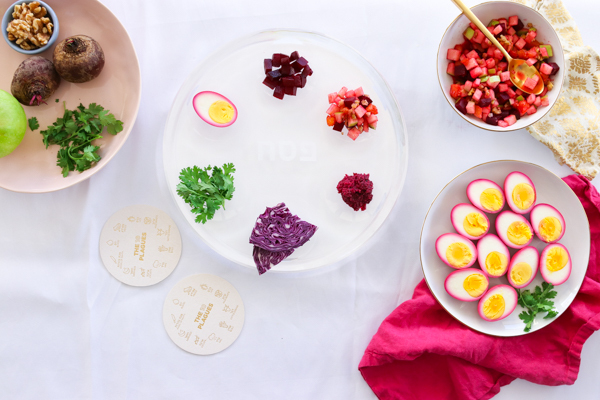 Toss beets in oil and salt and place on a foil-lined baking sheet. 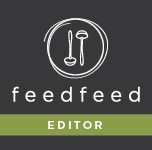 Roast for 15 minutes or until fork-tender. Let cool. You can also roast the beets peeled but whole and dice after. Up to you! 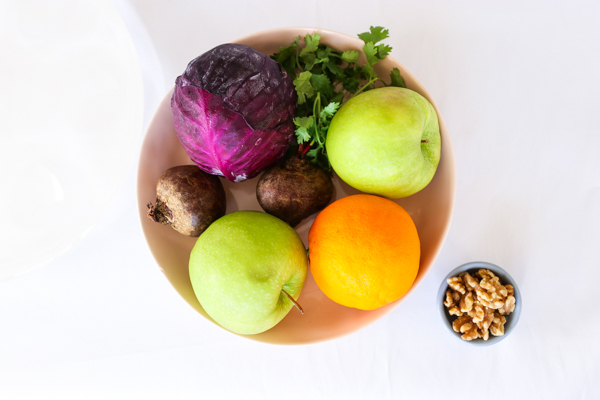 Peel and core your apples, dice them and toss with cooled beets in a large bowl. Then add nuts, cinnamon, honey and wine and mix again. Carefully fold in oranges (to segment the orange, cut the skin and pith off with a knife, then cut the segments out of the orange leaving the pith divided behind and then dice the pieces) and serve! 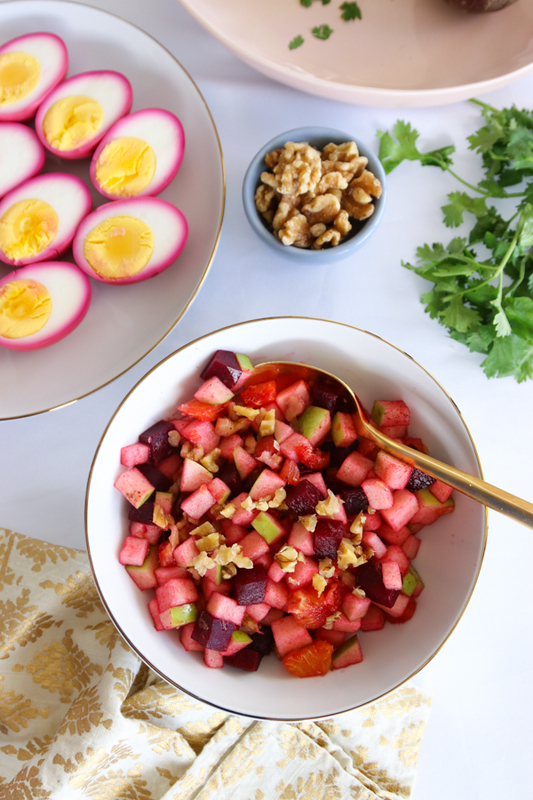 Can be made a few hours ahead of serving and stored in the refrigerator. I’m a risk taker like that!